Bernard Hopkins will turn 50 on Jan. 15 and five days later – on Jan. 20 – Golden Boy Promotions will help him celebrate by staging a card in his honor in his native Philadelphia. The main event will feature Eric “The Outlaw” Hunter (19-3, 10 KOs) of Philadelphia going against Rene Alvarado (21-3, 14 KOs) of Nicaragua in the junior lightweight main event at 2300 Arena. The card will be televised by Fox Sports 1. Hopkins, an all-time great at middleweight and also a former light heavyweight champion, most recently fought a title-unification bout with Russia’s Sergey Kovalev, who won a wide decision over Hopkins in November at Boardwalk Hall in Atlantic City. 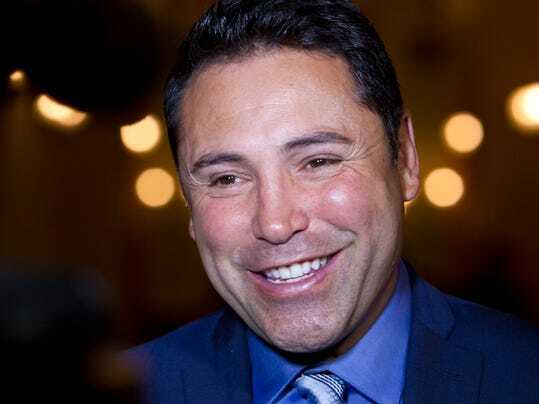 Oscar De La Hoya, president of Golden Boy Promotions, has been named Boxing Promoter of the Year by Sports Illustrated. Manny Pacquiao on Tuesday responded to Floyd Mayweather Jr., who Friday night during an interview on a Showtime Boxing telecast called on Pacquiao to make their long-anticipated fight that would – even now – likely break all gate and pay-per-view records. If the fight were to come to fruition, it could be May 2, the date of Mayweather’s next fight. Abner Mares of Hawaiian Gardens stopped Mexico’s Jose Ramirez after five rounds of their scheduled 10-round featherweight bout Saturday night at MGM Grand in Las Vegas. The bout was contested underneath Amir Khan-Devon Alexander. Mares decked Ramirez (25-5) in the first, third and fifth rounds. Mares (28-1-1, 15 KOs) is now 2-0 since losing his featherweight title to Jhonny Gonzalez, who knocked out Mares in the first round in August 2013 at StubHub Center in Carson. Amir Khan pounded out a wide unanimous decision over Devon Alexander on Saturday night in the welterweight main event at MGM Grand in Las Vegas. The fight was televised by Showtime. There were no knockdowns. But Khan won by scores of 118-110, 119-109 and 120-108. Khan out-worked Alexander the whole way, landing more punches and crisper punches. Khan, 28, of England, is a former junior welterweight champion. He is now 30-3. St. Louis’ Alexander, a former junior welterweight and welterweight champion, is 26-3. 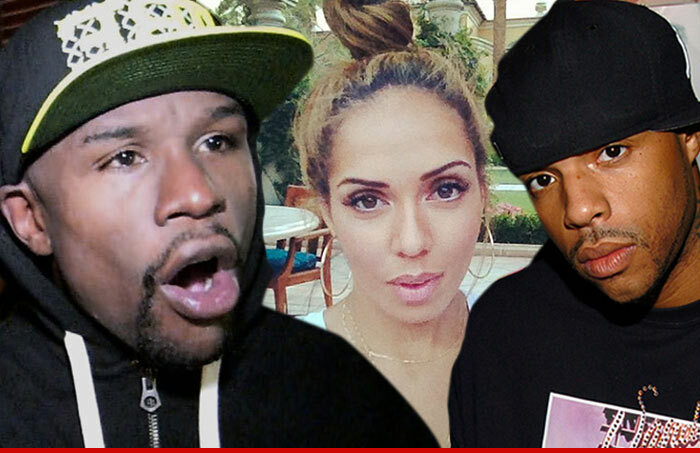 TMZ has reported that Floyd Mayweather Jr. was a face-time witness to the murder-suicide of his friend – rapper Earl Hayes – and Hayes’ wife, VH1 star Stephanie Moseley – on Monday morning in Los Angeles. Hayes apparently was upset over his wife’s alleged infidelity. According to the report, Hayes had called Mayweather on face-time and Mayweather was at least a partial witness – he allegedly heard everything – to Hayes shooting his wife and then turning the gun on himself. Copy and paste these two links for the full report from TMZ. Riddick Bowe, Ray “Boom Boom” Mancini and Prince Naseem Hamed have been inducted into the International Boxing Hall of Fame, the organization announced Thursday. Bowe went 43-1 with 33 knockouts fighting from 1989-2008 – at one point he went nearly eight years without fighting. Bowe was 5-1 in heavyweight world-title fights, his only loss coming via majority decision to Evander Holyfield in a title fight in November 1993 at Caesars Palace in Las Vegas. Bowe and Holyfield fought three times, with Bowe winning twice. Mancini sported a record of 29-5 with 23 knockouts fighting from 1979-1992. After being stopped by Alexis Arguello in the 14th round in October 1981 in his first shot at the lightweight championship, Mancini knocked out Arturo Frias in the first round seven months later – in May 1982 – to take the lightweight belt held by Frias. Like Bowe, Mancini was stoked to hear the news. Tragedy struck in Mancini’s second defense when he knocked out Deuk-Koo Kim of South Korea in the 14th round of a very brutal bout. Kim died four days later as a result of the injuries sustained in the fight at Caesars Palace. It was the fight that led to 15-round championship fights being reduced to 12 rounds. Mancini made two more successful defenses before losing the last four fights of his career – to Livingstone Bramble (twice), Hector “Macho” Camacho and Greg Haugen. Mancini retired at age 31. Hamed, an entertaining and very cocky southpaw, went 36-1 with 31 knockouts from 1992-2002. He was 16-0 in major featherweight world-title fights before losing to Marco Antonio Barrera via unanimous decision in a bout for a minor title in April 2001. Hamed had just one more fight and retired at age 28. The trio will be enshrined June 14 in Canastota, N.Y.
Non-fighter inductees include referee Steve Smoger, writer Nigel Collins and longtime HBO broadcaster Jim Lampley. Abner Mares of Hawaiian Gardens had been out of the ring for 11 months when he squared off with Jonathan Oquendo and defeated Oquendo via unanimous decision on July 12 at MGM Grand in Las Vegas. The fight before that, Mares lost his featherweight title when he was knocked out in the first round by Jhonny Gonzalez of Mexico on Aug. 24, 2013 at StubHub Center. Mares (27-1-1, 14 KOs) will be back in the ring again Dec. 13 when he takes on Jose Ramirez (25-4, 15 KOs) of Mexico in a 10-round featherweight bout on the undercard of the Amir Khan-Devon Alexander welterweight main event (on Showtime). Mares can’t wait. Mares, who turned 29 on Nov. 28, has won titles in the bantamweight, super bantamweight and featherweight divisions. Freddie Roach prods Manny Pacquiao to talk more about Floyd Mayweather Jr.
Manny Pacquiao has never been a trash-talker, but Freddie Roach has encouraged Pacquiao to be much more assertive when it comes to making his feelings known about how badly he wants to get Floyd Mayweather Jr. into the ring. Roach last week told this newspaper that the right people are talking about getting this fight done, but that Pacquiao can help his cause by getting a bit mouthy. Roach is referring to a Foot Locker commercial in which Pacquiao gets excited because he thinks Mayweather has finally agreed to fight him.